Another fantastic installment of Jeff Lemires post-apocalyptic fairytale. Sweet Tooth is an intimate, gripping, and, yes, sweet tale of common human decency managing to flourish in a world gone very wrong indeed. We see Gus and Jepperd move out beyond the ‘sanctuary’ that had kept Gus safe for so long – and he quickly comes to face to face with the horrors that the cataclysm wrought on the human race. The way Lemire portrays this can be subtle and heartbreaking, or devastating in its scope – no spoilers from me here, as you really need to experience it for yourself. Gus’ introduction to a wider world, as an innocent, sheltered from civilisation up to the point when it has already faded into memory, is reminiscent of the boy in McCarthys ‘The Road’, but that is not to say the comparison is a criticsm of Lemires work. Rather, I find the way Gus’ journey is being realised is touching and (within this fictional environment) totally honest and believable. Jepperd, as surrogate father figure, protector and action hero reminiscent of a very grizzled Clint Eastwood, balances out the naivety of Gus, and brings a weary counterbalance to proceedings. The pacing is terrific, a mix of action, pathos, tragedy, a nightmarish dream sequence and a great ending, where possibilities really open for this small cast of characters. 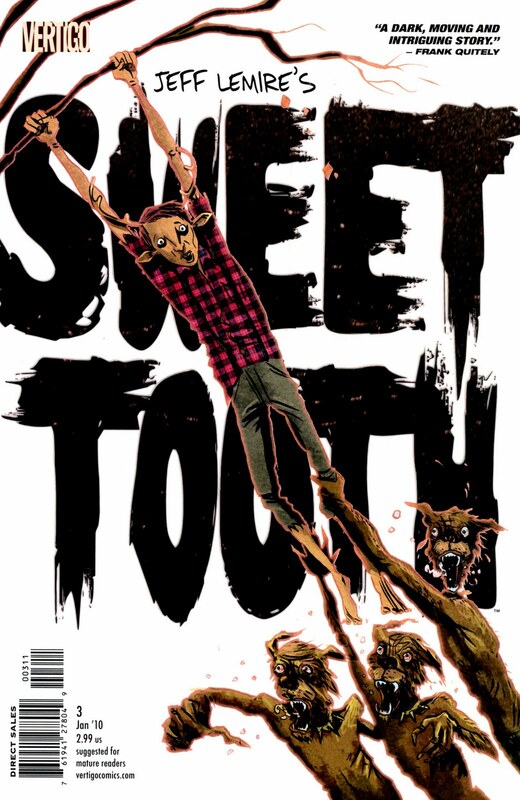 I have said it before and I will say it again – ‘Sweet Tooth’ is a brilliant read, one of the highlights of ’09 and another classic title from Veritgo. If you haven’t got into it yet, it’s not too late! This is one of those titles where the ‘singles or trade’ debate is null and void in my opinion, as I need a fix of ‘Sweet Tooth’ every month. Your mileage may vary, but one way or another, single or trade, this demands your attention.